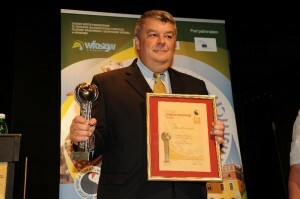 The award was given by the Global Forum Polish Media at its 20th Jubilee. Storozynski’s work as a journalist and activist were cited as Deputy Speaker of the Polish Senate, Sen. Maria Panczyk-Pozdziej, made the presentation. The Global Forum hosts Polish journalists from around the world and meetings in Krakow, Warsaw, Rzeszow, & Tarnow.